These photos are from the 1983 regional TV series Day Out produced at Pebble Mill. The first three photos feature Derby; the next four Tewksbury; and the last two the Peak District. 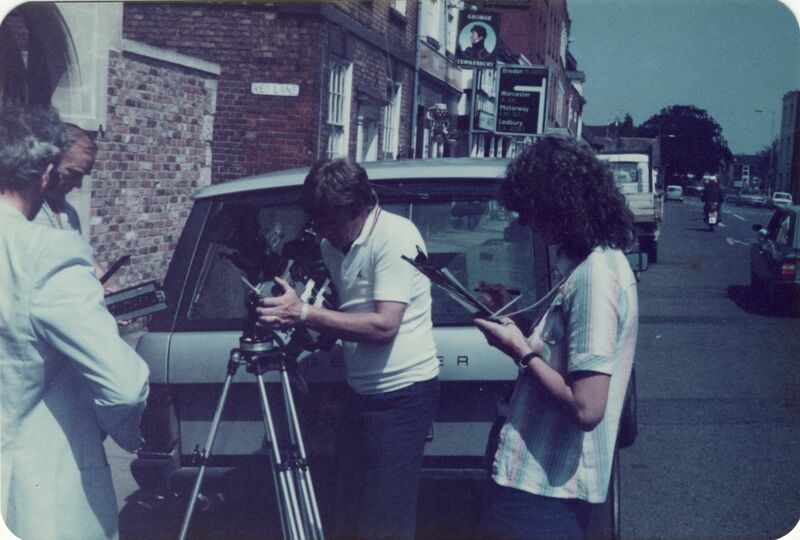 The cameraman in the first photo is Chris Weaver, in the Tewksbury photos the cameraman is Jim Knights, and soundman Keith Conlon, with Gail Herbert P.A. ; the cameraman in the Peak District photos is Pete Smith, Trina Bond the P.A and Mike Derby the director. First pic is Chris Weaver on camera, fourth pic is Keith Conlon on sound with Jim from Magpie. Thanks for that Simon, I’ll add those details into the post. I was the assistant editor in those ‘Regional days’, and sat behind editors like Richard Parfitt, John Rosser, Peter Gower, and Ian Bellion, filing the trims. The programme was made with a budget of 16-20 rolls of film, which meant the Directors and cameramen had to be super efficient – tell that to the youngsters today! It was effectively edited on camera (with the exception of St.John Howells many retakes for pieces to camera…) The programmes were shot on Ektachrome to save money, but that meant we had to be careful handling what was technically the master copy, and white gloves were the order of the day during editing. I think it took a week to edit, then i remade all the splices, ran it through a Selvet cloth with cleaning fluid and it went to Telecine. If you didn’t put the correct size centre spool in (2″), your horrific nightmare was it fell out, leaving you with a terrible job of delicately respooling it back on the steenbeck. This didn’t happen on this programme, but did on a Fishing Today, with 30mins to transmission.